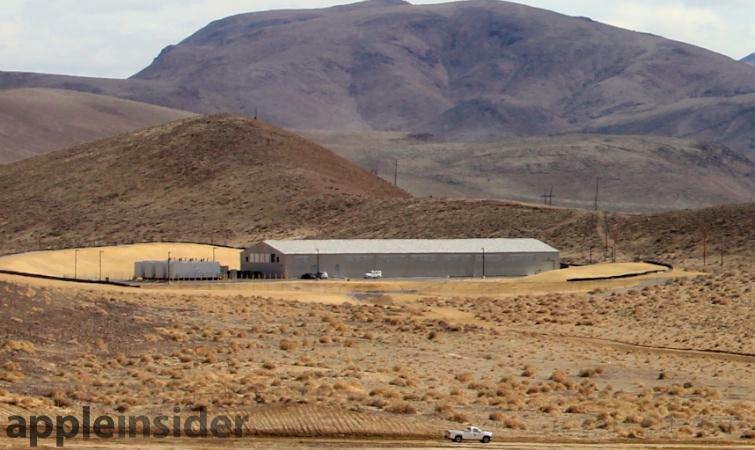 The new data center, located 15 minutes east of Reno at the emerging new Reno Technology Park, will be Apple's fourth major server farm the United States and the third project the company has built from scratch. In 2010, the company built a 500,000 square foot facility in Maiden, N.C., that went online in 2011, multiplying Apple's available data center square footage by nearly six over the initial 107,000-square-foot center it had acquired in 2006. Apple was reported to be planning a doubling of the Maiden site's vast structure. 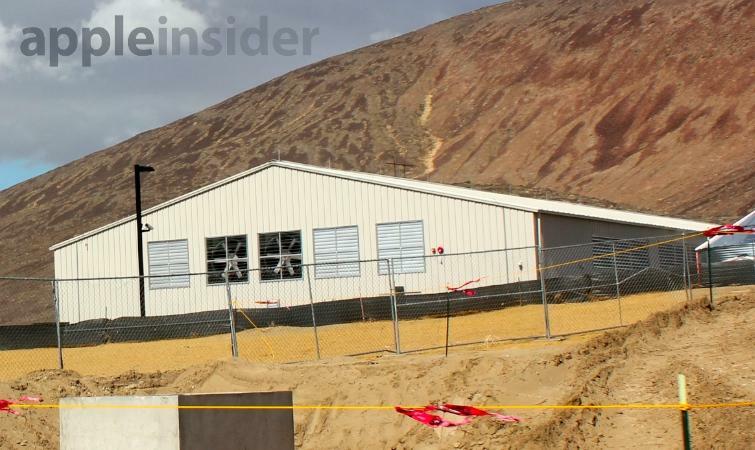 Last October, Apple broke ground on a parallel project now under construction in Prineville, Ore. A 338,000-square-foot building (about twice the size of a Costco store) is now taking shape there; a second, equally large building is planned to join it, again doubling the company's existing iCloud footprint. There's also lots of surrounding land left for additional buildings on the 160 acre site. The size and rapid construction pace of Apple's existing data center facilities makes it interesting that the company is now planning another large data center project relatively close to it: Reno is just 460 miles south of Prineville. 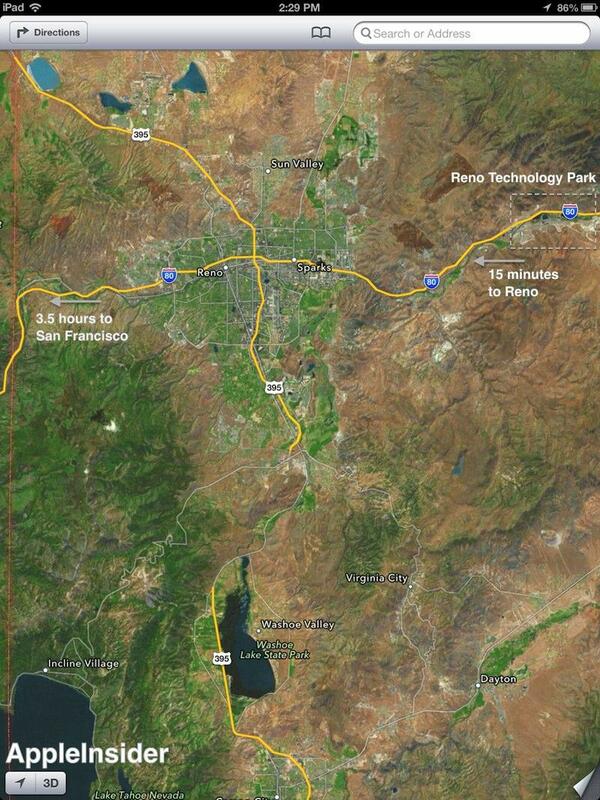 Even more surprising is the fact that Apple is moving forward on the parallel Reno site so rapidly. As the project site was still being finalized, the company asked for permission to begin work on an initial, aproximately 20,000-square-foot structure to get head start on the construction project. Both ends of the long building (pictured above) have five vents supporting massive fans to pull air through the structure. Behind it, there appears to be a water chilling system (visible below from the side) similar to the one built in Maiden. Pictured from the air (below, during final construction), Apple's initial building is just off the freeway but behind a hill, making the project site appear to be nothing but empty land to people driving past. The relatively small initial facility appears similar to a 21,000-square-foot secondary "tactical" structure revealed in permits at the Maiden site, as well as a 10,000-square-foot building Apple rapidly built in Oregon as soon as it acquired the land there. Plans for the similar structure in Maiden were described as involving "tight security measures," including "man trap" security doors that will require people to go through two doors to gain access, and an 8-foot-high chain-link security fence. The initial Reno facility is surround by black lamp posts outfitted with cameras, and is staffed with security personnel, although has only basic fencing in place. The simple initial structure is now apparently finished and, according to a person familiar with Apple's plans, is set to go online in the coming weeks. It is possible that Apple started work on the initial building to serve as a testing center to help in planning the full deployment, including optimization of the site's connection with local power, water and data networks. The company has 345 acres of land surrounding the building, nearly twice the area of its Prineville project, allowing for vast expansion of both data center buildings and supporting structures, including solar fields. As with its previous data center projects, Apple has taken a leading role in pushing the envelope in green design, with the Maiden facility being the largest data center to meet the strict rules of LEED Platinum construction.